You are browsing the Expos folder. Day 2 – Jean-Louis Gassée (EVP, Apple): Are Personal Computers There Yet? In the run-up to the summer exposition, MacWEEK described Apple as hoping to “solidify its new-found success in the business community with the release of a strong line of peripherals, communications products and systems software.” As Apple slowly began to work through production delays with the Mac II, it could begin to place more emphasis on the open, expandable system — previous trade shows had focused on the much simpler (and more available) Mac SE. SuperMac Technology continues its innovation with exciting new hardware and software for the Macintosh family. Come by our booth and see! Now shipping: Spectrum and SuperView high resolution graphics boards and monitors for the Mac II and SE; DataFrame 40 XP and 20 XP, our 20 and 40 SCSI Hard Disks. Sigma Designs will exhibit its LaserView Display System, the highest resolution (1664 x 1200) monitor and display board system available in non-interlaced mode for Desktop Publishing and Engineering. LaserView monitors come as 15″ or 19″ landscape models and provide useful features such as dual resolutions, multiple cursor sizes, switching between screens, screen-save timer, and others. The LaserView Display System works with both Macintosh SE and Macintosh II. Yet Macworld Boston did not turn the Mac II into an open platform overnight, despite expectations. “One of the more disappointing aspects of the MacWorld Expo held in Boston last August”,” wrote Macweek, “was a lack of NuBus product introductions, aside from color video and the data acquisition boards. It appears that Mac II users aren’t exactly clamoring for specialized hardware capabilities quite yet, and vendors aren’t rushing to introduce products.” With the benefit of several decades’ worth of hindsight, it’s clear that costs and complexities of next-generation card development hit both Apple and IBM as they tried to lure 3rd-party products to NuBus and MicroChannel, respectively. Second Wave, Inc. announces ExpanSE and ExpanSE II, expansion chassis systems for the Macintosh SE. ExpanSE expands the power of your Macintosh SE by providing a chassis with four expansion slots for Macintosh SE cards. ExpanSE II provides eight expansion slots for Macintosh II cards to operate with your Macintosh SE. Second Wave expansion systems include an SE interface card, cabling, and the expansion chassis which contains a power supply, fan, and external expansion brackets. The ExpanSE case (13″xl0″x8″) can be positioned vertically or horizontally on your desk. ExpanSE II is the same size as the Macintosh II. Expand the functionality of your Macintosh SE with an expansion chassis system from Second Wave! Radius, Inc.will show the Radius Accelerator and the Radius Full Page Display for both the Macintosh Plus and SE computers. The Radius Accelerator is an enhancement board which is capable of quadrupling the speed of the Macintosh. The Radius Full Page Display (FPD) is a 15 inch large display screen. The Accelerator and FPD transform the Macintosh Plus or SB computer into a professional desktop publishing system by adding greater processing speed and a larger display. Of these, the ImageWriter LQ would not ship until the end of 1987. Apple was still several years away from the Mac Portable, so show-goers had to make do with two third-party options: DynaMac and Colby. Both re-purposed a ROM chip that was only obtainable from a retail Mac, which made them expensive machines indeed. The Tecmar QT-Mac 40, a portable 40 MB tape backup system, is designed for use with all SCSI-based Macintosh systems. Combining the high speed flexibility of SCSI with industry standard QIC-100 compatibility, the QT-Mac40 makes the task of maintaining reliable backups quick and easy. Because of its unrivalled small size, the QT-Mac40 is portable and can easily serve the backup and archival needs of several users. The QT-Mac40 is the perfect complement to all Macintosh SCSI hard disks. SuperMac’s software introduced Tapes Fit, a tape back-up system for the Macintosh that presumably worked with 3rd-party tape drives. Perhaps the first 256-color paint program for the Mac, PixelPaint was developed by Pixel Resources and published by SuperMac. It was positioned as a software showcase for the latter company’s new Spectrum 8-bit color video card for the Mac II and accompanying 19″ monitor. Journalists noted that besides SuperMac, vendors such as PCPC (Personal Computer Peripherals Co.) and Mitsubishi were also shipping large-screen displays that would show off the software to good effect. T/Maker released ClickArt PostScript Images, a $130 collection of 125 vector-based clip art images for laser printers, as well as a “vertical” product aimed at a specific demographic: ClickArt Christian Images. VideoWorks II — A new, more versatile and more powerful version of the acclaimed animation tool VideoWorks. Its new Over View window is an easy to use front end that adds slide show sequencing of animations and/or illustrations to the original animation system. The animation program features two ways to animate (real-time and cel), color capabilities (for the Macintosh II), and a unique scoring system. Animations may include elaborate sound effects including Macintalk, sampled and synthetized sound. VideoWorks II comes complete with everything you will need to leam the product; interactive tour disk, written tutorials, sample animation and art disks, and an extensive manual. VideoWorks would of course grow into MacroMind Director, one of the behemoth multimedia authoring packages of the 1990s. ￼Wordperfect for the Macintosh includes features such as macros, merge, footnotes/endnotes, table of contents/index generation, paragraph/outline numbering, onscreen text columns, 115,000 word spelling checker, thesaums, and is file compatible with Wordperfect 4.2 for the IBM. Conversion from other word processing formats is provided, as well as support of the DCA format. The software wouldn’t ship till April of 1988, however. Microsoft showed Word 3.01, Works 1.1 and Excel 1.04, “working together in an office scenario on an AppleShare network.” New features in these products included Mac II compatibility and the removal of copy protection. The MACazine will be demonstrating the desktop publishing system used to put together our page layout. Our editorial staff will be available for questions and comments. Letraset unveiled Ready, Set, Go! 4.0 with style sheets and text wrapping features. NEW! Springboard Publisher is an integrated desktop publishing program that offers page layout, word processing and graphics creation all in one program. Springboard Publisher is designed for people in home, school and business environments, enabling them to create professional looking pages quickly and easily. Springboard Publisher offers total page layout control, allowing users to change their design as easily as they change their minds. Text and graphics can be placed anywhere on the page. Software Supply introduced Suitcase, a ‘long-awaited’ font management utility that would go on to play a large role in enabling Mac users to load and unload fonts as needed. word processing-includes auto-hyphenation, 80,000 word spelling checker global search and replace. typography-auto or manual keming increments .01 em-space, leading to .001 of an inch, font sizes from 2 to 500 points, tracking and horizontal scaling. page layout-hierarchical box system, precision placement, text pipelining, columns, continued to/from messages, auto pagination. test runaround-automatically runs text around irregularly shaped graphics. MaacroMind showed off VideoWorks II, featuring color support. Spectrum HoloByte will be showing the two latest additions to their simulation product line. Falcon is the F-16 fighter simulation that puts the user in the cockpit to perform fighter maneuvers while engaging enemy MiG’s in dogfight battles. Sound and digitized airplaine images lend to realism and playability of Falcon. Another new product PT-109, the torpedo boat simulation, takes you to battle on the seas. Enemy attacks will come not only by sea, but from the air as well, so the user must be prepared to make most effective use of his arsenal of weapons consisting of torpedoes, depth charges, rockets, and machine guns. GATO, ORBITER, and TellStar, are other products being displayed. Intelligent documents will have as much impact in changing the environment of the business world as the telephone had at the beginning of the century or the Xerox machine has had in the last two decades. For the first time in our history, we know what our products will be, not just in 1987, but in 1988, 1989, and on into the 1900s. Our Cray is being used to simulate the products we will put into silicon and bring into the marketplace in the 1990s. We have a clear vision of where we want our company to go. It’s not completely what Sculley meant by “intelligent documents,” but one is tempted to think about a feature which would ship in 1991 in System 7: Publish and Subscribe. At any rate, Sculley also mentions “Intelligent Documents” in his 1988 book Odyssey, which is a source I’ll read in the future for clues to this concept. The line between word processing and DTP begins to blur as Word, FullWrite and WordPerfect adopt layout features such as hyphenation and wrapping text around irregular objects. (See, however, the continuing delays which plagued FullWrite after its promising introduction at this Expo.) 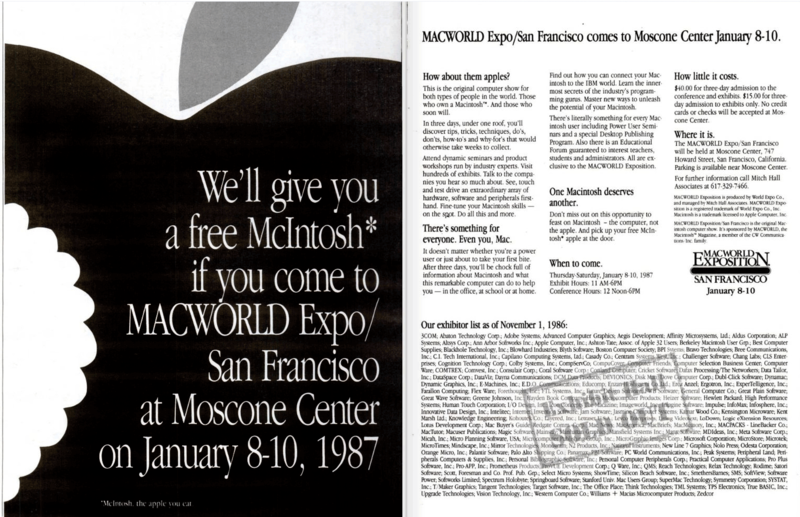 The idea that word processors would expand into the DTP market was current at this time — in February, Computer Chronicles quoted no less a source than Steve Jobs as saying DTP would soon cease to exist as a distinct market. The fact that PageMaker 2 would ship on the PC before the Mac heralded Adobe’s increasing cross-platform focus, much to the dismay of show attendees. Excel 1.03 jumped on the bandwagon of larger-screen support, reflecting the reality of a marketplace where external displays from companies such as Radius had helped transform the reputation of the Mac from toy to serious tool. Trapeze, from Data Tailor, got a lot of attention during this Expo as a kind of next-generation spreadsheet — I’ll try to write up a separate post on this app in the future. In the meantime, read this review of version 2, released 9 months later. Illustrator, the brand-new vector drawing tool from Adobe, made even sophisticated raster programs such as SuperPaint look like yesterday’s news. Yet people weren’t really sure how an object-oriented drawing system would work: there was as much emphasis on tracing an outline of scanned artwork as there was on creating drawings from whole cloth. As seen in the above video, Adobe was showing off their new program at both their booth and at that of Radius — again showing the importance of that hardware company in the Mac marketplace. Living Videotext upgraded its MORE outliner to 1.1 — now with Undo! It’s striking to run across the Dave Winer of 24 years ago: he was then president of the company. MORE 1.1 also offered styled text and hierarchical outlining, two features we take for granted today. Also fascinating that there was a market for $300 outliners back in 1987. But MORE wasn’t even the only such product — Symmetry likewise showed off Acta 1.2 (now with printing!). And Borland showed off an their PIM product, SideKick. This might be a record for a product’s longevity: CE Software introduced DiskTop at this Expo, which as of 2011 was still for sale and working (at least in Classic and on PowerPC Macs). You can read a review of the modern version DiskTop from 2000 (when it was already considered a miracle of survival) from TidBits. In keeping with the DTP theme of the show, Think Technologies was selling a $100 print spooler called LaserSpeed. Supermac introduced both tape backup drives as well as external hard drives. A company called Lodown (?) also showed off a 32-shade greyscale SCSI scanner for a mere $1,300. In keeping with Macintosh Office fever, Kinetics showed off a SCSI/Ethernet adaptor for the Mac Plus. (Can you just imagine how slow that would be?) At least the price was reasonable, only $1,250. Reading these stories really makes you realize how much different the world was in ’87: getting a faster network to the slowest machine Apple sold was worth an investment of well over a thousand dollars. This tells you something about the costs of faster and more capable systems. Think Technologies showed off Inbox for Mac, one of several LAN-based email systems that would briefly flourish, before dying off in the Internet era. Hard to believe the per-seat cost was $125.